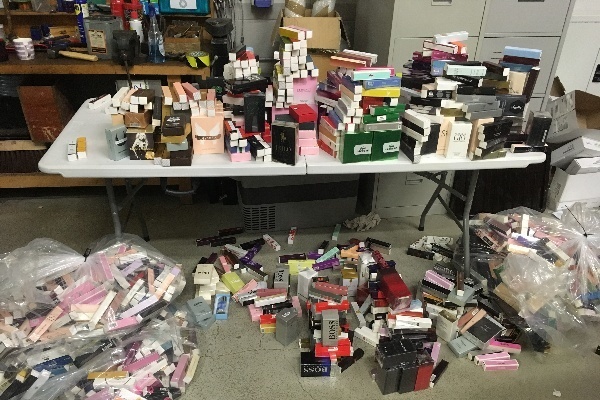 Hundreds of thousands of pounds worth of counterfeit cosmetics, including make-up and perfume, have been uncovered by trading standards officers across the country, says the UK’s Local Government Association (LGA). Fake cosmetics being sold by rogue dealers include rip off versions of well-known make up and cosmetic brands including MAC, Chanel and Benefit. The LGA is warning that, as well as defrauding consumers and legitimate businesses, these products can pose serious health risks, including chemical burns and skin rashes, due to the chemicals included in them. Exposure to mercury in fake cosmetics can be detrimental to people’s health, as it can have toxic effects on the nervous system, digestive and immune systems, lungs, kidneys, skin and eyes. According to the NHS, at very high levels, lead poisoning can result in hallucinations, seizures, coma and death. Cosmetics seized by Devon, Somerset and Torbay Trading Standards Service included products containing chemicals such as highly toxic mercury and illegal levels of the skin whitening agent hydroquinone. One skin lightening product was found to contain hydroquinone at a level of 10.8 per cent, and another product, JJJ Golden Spot Removing Cream, was analysed and found to contain mercury. This toxic element can accumulate in the body and cause liver, kidney and brain damage. The prosecution of a tanning salon owner in Cheshire who had sold more than £100,000 of fake designer goods, which included make up brands and perfume, such as MAC and Chanel. The sales of counterfeit make up was uncovered during an investigation led by trading standard officers at Cheshire East Council. An investigation by Nottingham City Council discovered fake Benefit mascara sold by two women. The trading standards officers found 349 counterfeit mascaras with an eBay sales value of £1,690 and one of the women had received Paypal payment in excess of £48,000 from the sales of fake make-up. 275 fake make up products which had a street value of £2,258 were seized from a property in Grimsby. They included mascara, eye brow, lip pencils, lipsticks and concealer and were copies of well-known brands such as Benefit, Dior, Nars and MAC. Counterfeit investigations are being carried out by North East Lincolnshire Council. “Counterfeit cosmetics can be dangerous as they can contain toxic chemicals and dangerous high levels of lead which can be detrimental for people’s health. “Fake designer products costs businesses and the taxpayer thousands of pounds each year. Councils have been targeting rogue retailers selling these fake products, and the fines they have received should deter others from selling these dangerous products. “People should always do their research and take a pragmatic approach when they are buying make-up and cosmetics. Check the reviews of online sellers, and bear in mind that if something is really cheap, it’s likely to be fake and could potentially be harmful. "Anyone who has purchased make up that they think is dangerous should stop using it immediately and report it to their local Trading Standards team. Scotland issues challenge: can tech help stop illicit trade?